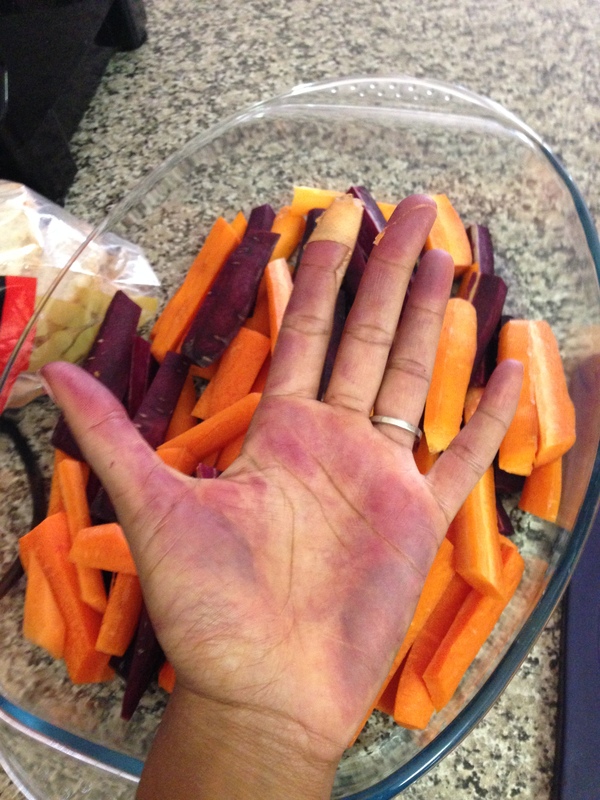 Warning: Purple Carrots will turn your hands purple. It’s challenge day and I’m up early preparing the pork. 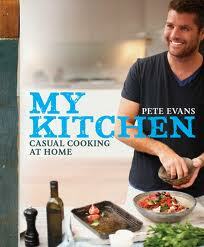 I’m making the Slow Roasted Shoulder of Pork with Carrots and Crackling from Pete Evans’ My Kitchen Cookbook. I was really meant to do this last night but our “come over for a couple of quiet drinks” got a bit out of hand and turned into a mini dinner party. I even roasted a chicken! 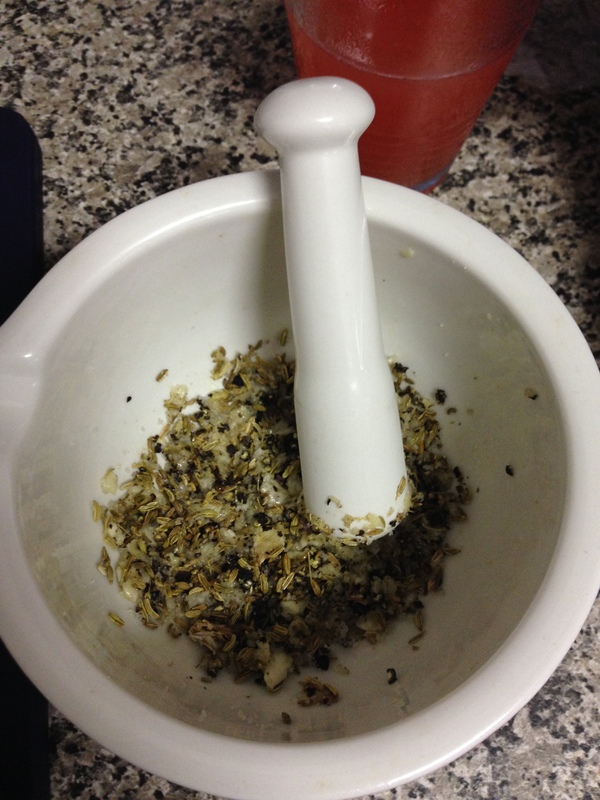 I start the preparation by pounding garlic and fennel seeds with a mortar and pestle and smearing it all over the flesh of the pork. It’s at this point that I realise that things have gone horribly wrong—I’ve bought a boneless pork shoulder not a bone in shoulder—not sure if it’s going to make a difference and with a cooking time of 6 hours according to the recipe, I know it’s going to be a while by the time I find out if it matters. This recipe is deceptively simple at first- rub the garlic-fennel mixture over the flesh of the pork and put it in the fridge flesh side up for a few hours. I happily complete this first step and then turn my attention to dessert. As you know, I was quite concerned about what dessert I would make but I decided on- my mother’s famous drunken Fruit Salad (fruit + Grand Marnier+ sugar= boozy AND healthy! WINNING!!!!!) 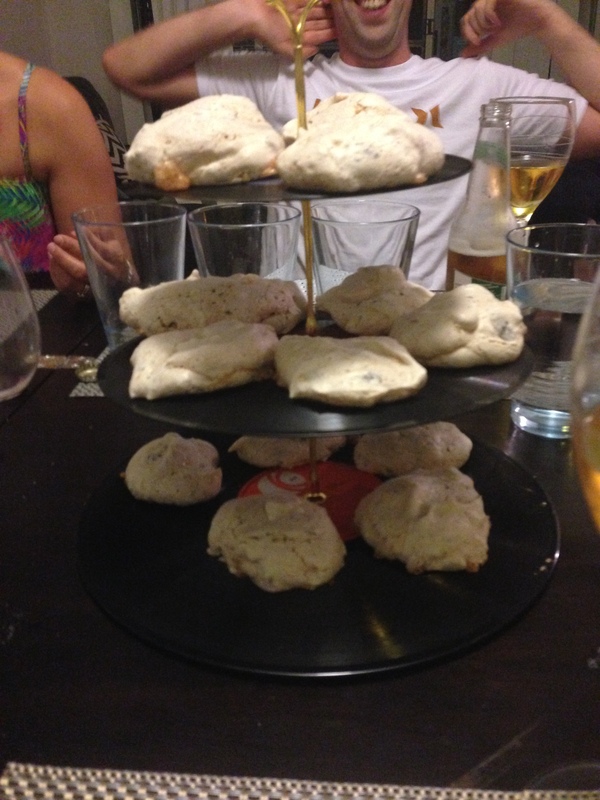 and Suspiros—basically a Spanish take on a meringue –according to Australian Gourmet Traveller magazine. A magazine I stopped my subscription to after realising that their recipes are way too complicated, and the ingredients way too weird—oh and that I don’t have the income to support jaunting off to the Mediterranean’s finest 6 star resorts every week. It’s a VERY aspirational magazine…. Do you know they actually had the nerve to include a recipe that called for “Female pork belly”? What The Fudge? One, who cares if it’s male or female; two, how would you know unless you killed the pig yourself; and three, where would you find it—my local butcher doesn’t even stock Pork Belly regularly let alone Female Pork Belly. That and the number of recipes that require you to start them a day ahead meant the end of me and Australian Gourmet Traveller. We had a lovely relationship for a couple of years and I did tear out a few hundred recipes that I thought I might cook but never have. In an effort to de-clutter before The Runner gets even more exasperated over the number of recipes and cookbooks in the house, I have been purging some of my magazine recipes especially the “dream” recipes. And they’re “dream” recipes because I was clearly drunk or dreaming when I tore them out of the magazine and thought I would ever cook them. Things like Banh Mi with homemade bread and make your own XO sauce for stir fry prawns…. Seriously, what was I thinking??? So that’s how I came across Susspiros. They’re very easy. Pretty much they’re meringues with vanilla, cinnamon and chocolate. Yum. But of course they take 2-3 hours to cook in the oven so figuring out the timing of 6 hours of pork and 3 hours of meringue—yup, it’s 10:30 in the morning and I’m already behind on our 7:30 dinner. OH well….. I trod off to the store and get distracted in Dan Murphy’s looking for red dessert wine for the peaches I was going to make to go with the susspiros. I couldn’t find it, but that didn’t stop me from wasting more time in Dan Murphy’s buying wine to have with dinner—plus some Guinness for The Runner. Of course, the actual grocery shopping takes longer than expected and by the time I get home, I realise dinner will officially be very very very late. But that’s ok, I don’t have to work tomorrow. The pork goes in the oven about 2:30 after I cut up carrots (the purple ones turn my hand quite a shade of purple) and pour warm chicken stock and warm water over the carrots and the pork. I cover the dish with 3 sheets of tin foil and sit and relax for 6 hours… well not quite but I do get to sit for a bit. 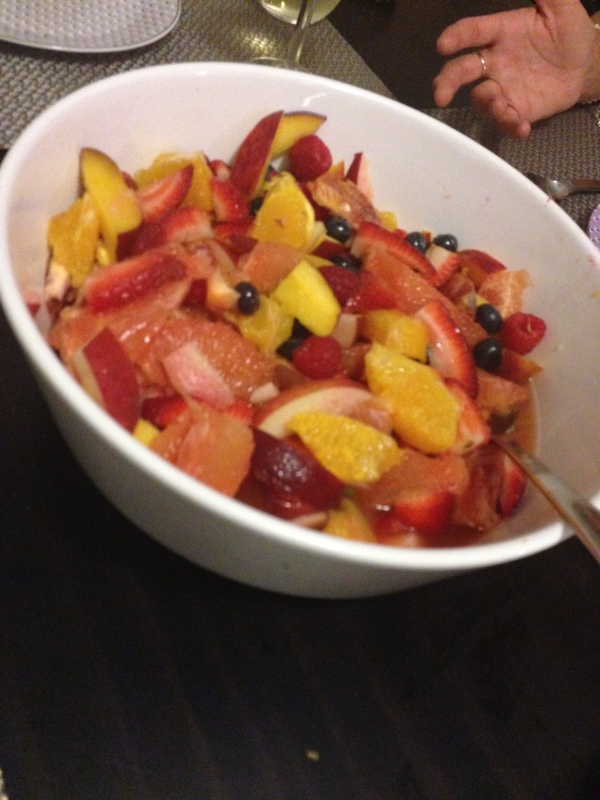 Also for dessert is drunken fruit salad- this is the fruit salad which we always made on Christmas morning. Really, it may have just been a way to legitimize alcohol before 8am but it’s tasty and a family tradition that no one questions. And people like it at dinner parties. I definitely take after my mother and can be a bit heavy handed with the Grand Marnier (or so I’ve been told) so I resist the urge to add a little more in and just leave it to sit. The pork itself does take forever— probably because I’m also too nervous to unwrap the foil to check to see how it’s cooking. But after about 5 hours I can’t take the suspense any longer and I check the pork. 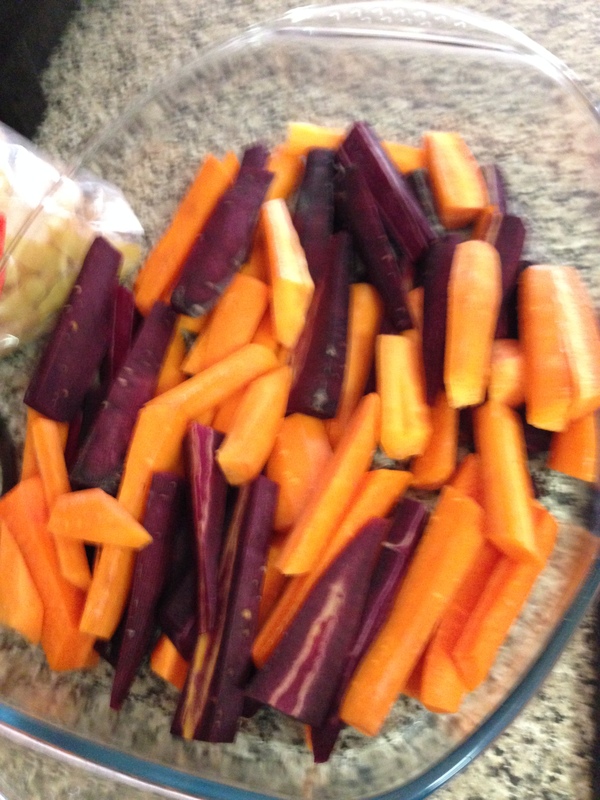 Two things: 1, purple carrots don’t just turn hands purple, they actually turn everything purple and 2, all that liquid in the beginning means even more liquid at the end- which makes the roasting tray both heavy and splashy. So great, now there’s purple juice on the floor. I wrap the pork back up and stick in the oven for another 30 minutes. Eventually, the timer goes off again and I take the purple pork out. The next instruction is to peel off the rind and crank up the oven to make the crackling. 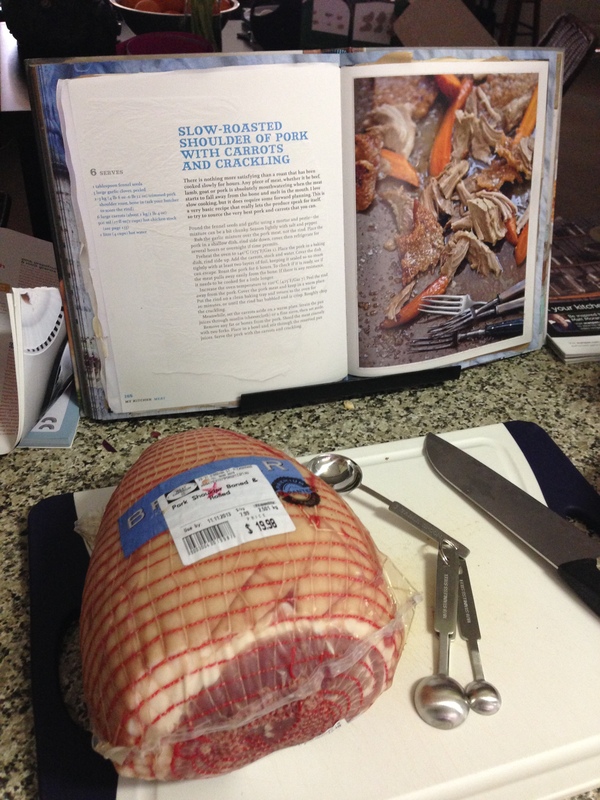 I follow the instructions to the t but the crackling does not crackle. Very very very disappointing but after waiting and waiting and waiting, I give up on the crackling. The pork is super juicy and super tender- I literally use two forks to shred it and it just falls apart. YUM! I strain the juices and pour them over the pork and voila! Slow roasted pork with crackling and carrots served with slow roasted potatoes and blanched asparagus.